Believe it or not, I have several entries that I’ve started and put on the back burner. Life’s gotten a bit busy lately, and I do have SO MUCH to post about, but first I wanted to tell a story. In Toronto, there’s a place called Sanctuary. It’s a drop-in centre for the street-involved (or homeless) community. There are the usual weekly dinners and support groups, but on top of that Sanctuary also runs art programs designed to give the community a chance to let their voice be heard. This includes music, painting and, the one that most directly affects me, theatre. 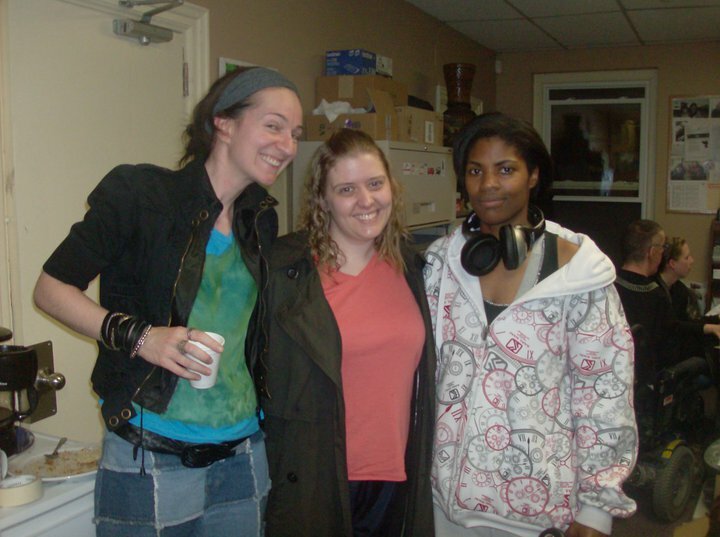 I’ve been working with Sanctuary as an actor on and off for about five years now. 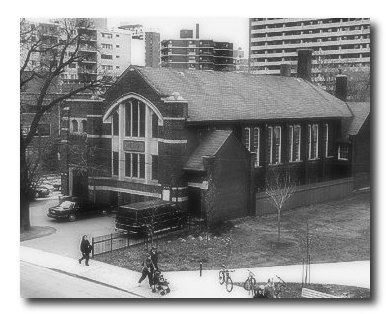 In fact, Sanctuary was where I did my first major play after moving to Toronto. It’s been some of the most rewarding and toughest work I’ve ever done, both artistically for myself and socially as I got to know and work with the street involved actors. I learned a lot about myself through each of those shows. 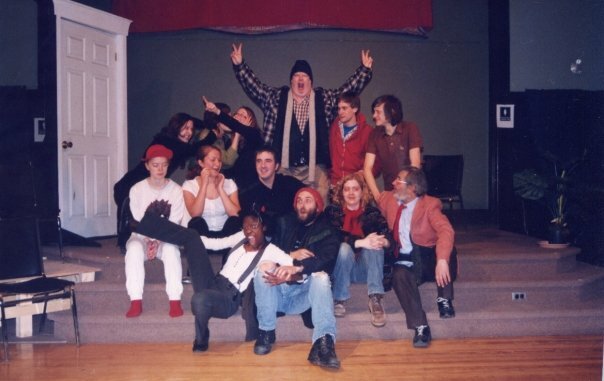 The cast photo of my first show! But this isn’t the story I want to tell. Last week I got an e-mail from my friend Lyf, who works at Sanctuary. He was in a bit of panic. 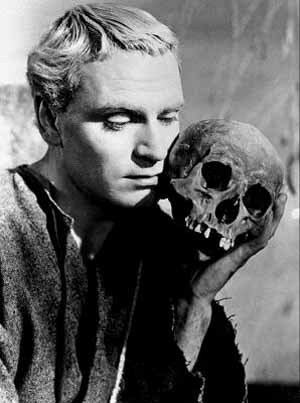 Over the last few months he had been working with a few of the community members to get them to study the famous “To Be Or Not To Be” monologue from Hamlet and then to write and perform their own interpreations of it. This is Lyf and I in that first show. He produced, directed and starred in it. He went almost as mad as his character. He had planned to film a performance of one of these monologues, written by a man named Rammstein. Unfortunately, his camera op got sick. He asked if I could help out, since I at the very least had a camera. I warned him that all I could really do was turn on the autofocus and point it in the right direction, but he was in a bind and was willing to take whatever he could get. And so I agreed. I arrived at Sanctuary at around 8:30am. There was no answer at the doorbell. I then received a text from Lyf. Rammstein had not shown up. He was out looking for him. He came back to let me in before beginning the hunt again. 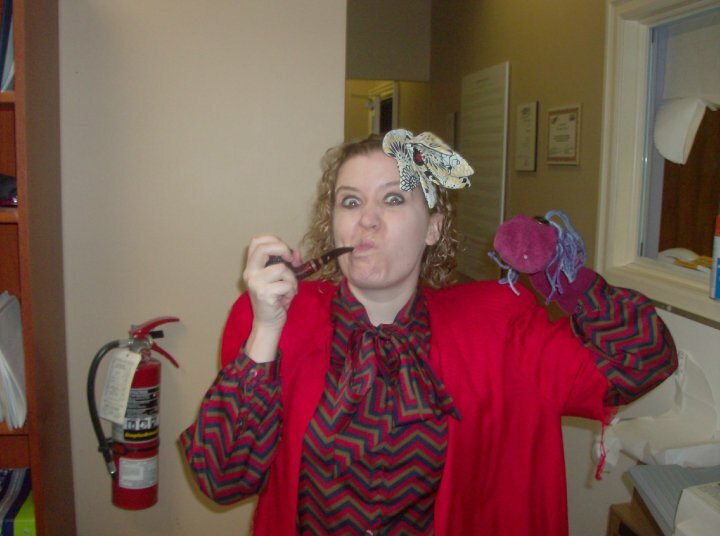 In case you thought that all Sanctuary plays would be serious, here’s me as a crazy lady with a sock puppet. This was an insane play. I waited, playing my DS and checking the camera. This didn’t faze me too much. The reality of acting at Sanctuary is that there is a good chance that some of your actors will show up late, or sometimes not even at all. There were a few performances when we stood around anxiously waiting for a cast member, wondering which director or assistant director we might have to shove on stage in their place. Finally, an hour after we were supposed to start, Lyf arrived back with Rammstein. For the most part, I’m used to working with what are called “high functioning” members of the community: people who might have some sort of housing and have somewhat stabalized their lives and minds. Rammstein was not high functioning. He was an alcoholic, living day to day on the streets. Lyf had promised him a bottle of Kelly’s Wine for him if he showed up. He explained to me that it was also to stop him from getting the shakes. Yes, that is a jar of cheese whiz. Yes, I did consume it on stage. Yes, it is as disgusting as it looks. I suffer for my art. Lyf had been hoping to get Rammstein sober but it seemed the timing wasn’t right. 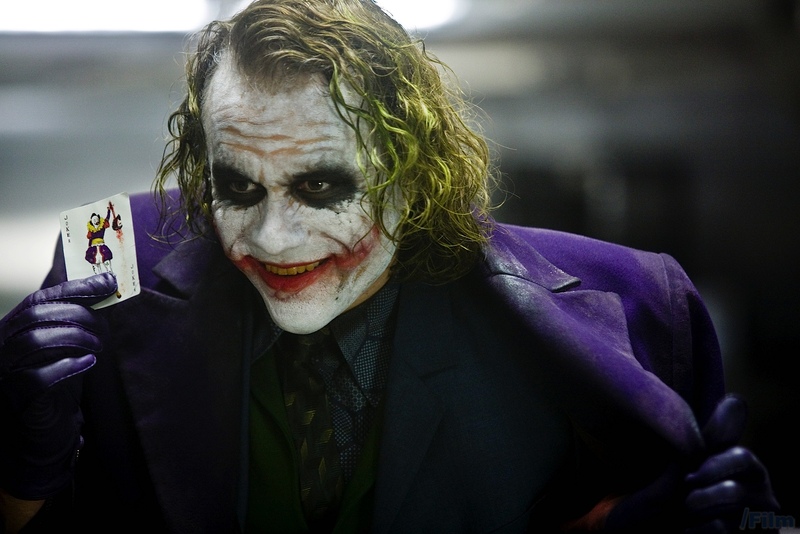 The man standing in front of me swayed back and forth, smelling of about five different kinds of alcohol and quoting Joker’s lines from The Dark Knight. Iwas introduced and he smiled and said hello but I doubted my name really registered. Lyf didn’t waste time. He began to fit Rammstein with a lav mic, explaining it’s purpose to him and what the plan for the day would be. At that moment, Rammstein pulled out a folded piece of paper and began to recite something off of it closing his eyes in concentration. It was his monologue. As Lyf went over what he would be doing for the performance, Rammstein interjected his own ideas and suggestions. We should start with this scene. A couple of the lines should be changed. We should use a black hoodie for the mic because it was less noticeable. All of these were were spoken in slurs and interjected with more Dark Knight quotes. Lyf had grand plans for the shots, but with our sudden lack of time and Rammstein’s state we had to scrap them for something simpler. We walked out to the alleyway. Someone else, David, also drunk, was already sleeping there. David was confused and not pleased to have been woken up. Nor did he want to move for any reason. Lyf took it in stride, explaining to David as best he could what they were trying to do. David’s gaze fell on me, and a suspicious look entered his eye as he asked “What’s your story?! Who is this woman? !” Rammstein slurred out that he was about to act, and Lyf explained I was just the camera person. But with something far less fancy than this. By then Rammstein had already settled into his position next to David. There was no moving either of them. Lyf told David he could stay, but could not make noise. He asked if David could pretend he was asleep. Before the sentence was even out of his mouth David fell back on the cushion he had been sitting on and shut his eyes. It seemed we could begin. I positioned the camera as best I could to keep David out of the frame. Rammstein began the monologue, starting by talking directly to David. We stopped the take. Lyf tried again to explain to David that he had to be quiet. Rammstein said very seriously that this was acting and it had to be done right. Accordingly, David fell back on the cushion, eyes shut once again. This was another serious play. I played someone who had a baby on a rooftop then went crazy and died. It was…a tough show to do. We realized that we would have to move. Lyf managed to wrangle Rammstein who stumbled towards our new location. David began to follow. Lyf, patient as ever, ordered him to sit back down. But David, despite not wanting to be in the video, certainly didn’t want to feel left out. Lyf finally bargained with him. David could watch, but could not talk. While Lyf calmed David down, Rammstein was scouting out new areas. He turned to me, excited, pointing to a heap of junk furniture. “This would be really cool to film!” He declared. Lyf came over, about to explain once again the scene we would be filming when Rammstein interrupted him. “I’m just gonna do the monologue, okay?” He stumbled over to the wall, leaning against it, wine in hand, ready to begin. For a moment Lyf looked as though he was about to argue, but then shrugged. Much like life, things didn’t always go according to plan. We acted as quickly as we could, setting up the shot. There had been an entire story that was going to be done, but there was no time. A single monologue at a single location would have to do. I rolled the camera. Lyf yelled action. I’ve seen Hamlet a few times now. I don’t think there’s any performance of it I’ve seen that was as emotionally vulnerable as Rammstein was in that moment. Suddenly a new focus took over the drunk man who previously could barely register his instructions. He told his story, his face a wash of emotions. At one point he began to cry, then in the very next moment pull himself together. “To be or not to be…the answer that killed the question”. It was hard not to be affected by it. I was tearing up. 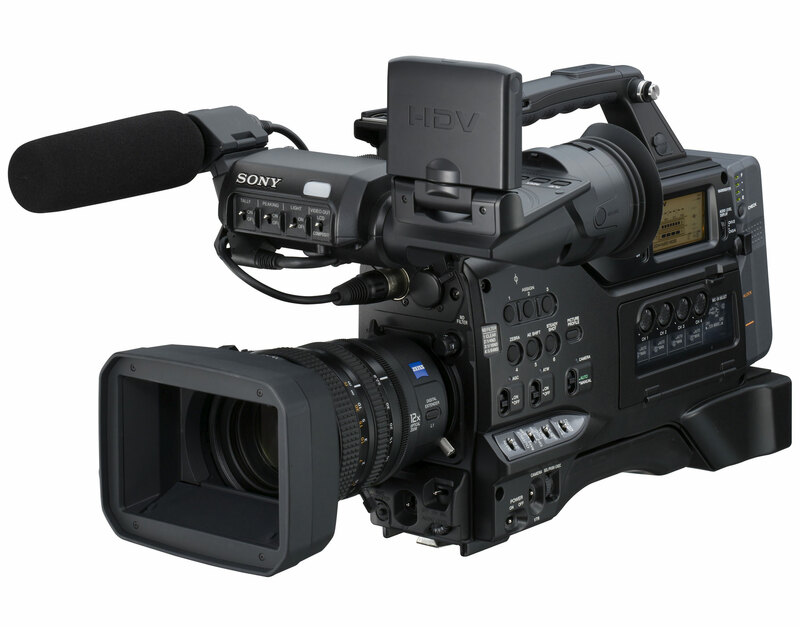 Behind me, Lyf frantically whispered camera directions and I complied as best I could with a couple of hiccups. Rammstein continued on. This was his moment and he had been preparing for it. He performed the monologue twice. Lyf then said cut, and Rammstein turned to me, his face etched in worry. “That was hard.” He said. I nodded in agreement. “But it was really good.” I told him back. He asked me who he reminded me of. Was it Robert DeNiro, he asked hopefully? “Who’s that?” He asked, then looked proud when we explained. That day, Rammstein was drunk. He was out of it. He was, at times, belligerent. He was in a bad way. But he desperately wanted to perform that monologue. It was the most important thing to him in that moment. He had a story to tell, and Hamlet helped him do that. I can’t praise enough the work that Lyf and Sanctuary does. And it’s tough work. Watching theatre do that for people, watching them, even for a moment, find solace and a voice through art is something I rarely get to experience in the normal theatre world. We thanked Rammstein for his work and left him with David. The two continued to drink, laugh and argue in loud, rough voices. Rammstein may not get better. He will remain hurt and damaged. People will still ignore him on the street, myself unfortunately included in that bunch who guiltily cannot always meet his eye. Who knows where he’ll be even in the next year. But for those two minutes, the world was his, and for five minutes after that he felt pride in something he did. Posted on June 6, 2013, in ramblings and tagged hamlet, lyf, rammstein, sanctuary. Bookmark the permalink. Leave a comment.